Also serving communities of Little Chute. There are 32 Assisted Living Facilities in the Kimberly area, with 2 in Kimberly and 30 nearby. The average cost of assisted living in Kimberly is $3,850 per month. This is higher than the national median of $3,346. Cheaper nearby regions include Neenah with an average starting cost of $3,550. To help you with your search, browse the 110 reviews below for assisted living facilities in Kimberly. On average, consumers rate assisted living in Kimberly 4.0 out of 5 stars. Better rated regions include Appleton with an average rating of 4.2 out of 5 stars. Caring.com has helped thousands of families find high-quality senior care. To speak with one of our Family Advisors about assisted living options and costs in Kimberly, call (855) 863-8283. St. Paul Elder Services, Inc. Originally known as The Cedars after the Treaty of the Cedars, Kimberly, Wisconsin, is a village situated in the southeast corner of Outagamie County. The village hosts 6,744 residents, 27 percent of whom are 55+ — the highest percentage of seniors are 75 to 84 years old. Seniors can seek care at 58 assisted living facilities in Kimberly area, two of which are within the village. 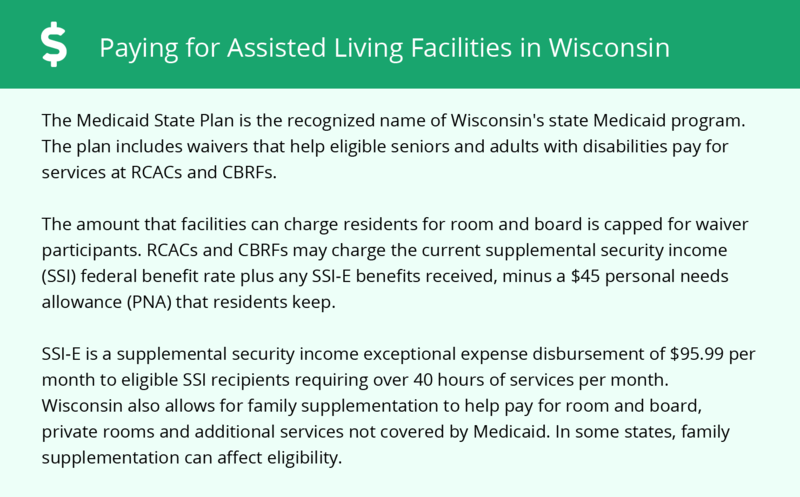 The Wisconsin Department of Health Services, Bureau of Assisted Living, Division of Quality Assurance serves as the regulatory agency for Kimberly’s ALFs. While utilities, transportation and health expenses all are higher than the national average, Kimberly, Wisconsin, provides housing costs that are 31 percent lower, which impacts the monthly cost of ALFs. The cost of living is 9.5 percent lower than average, which might help seniors on tighter budgets make ends meet more easily. Violent crime in Kimberly, Wisconsin, is a little higher than the national average, ranking 39.7 out of 100 (100 is worst) compared to 31.1. Subsequently, seniors might want to make sure the ALF they select has better precautions in place to protect physical well-being. Property crime, however, is comparable to the national average (38.5 versus 38.1). Kimberly, Wisconsin, stays true to the harsher Midwestern climate, providing cold winters (low of 11 degrees Fahrenheit) with plenty of snow (42 inches annually). Rainfall is on the drier side (31 inches per year compared to the average of 26). The Sperling Comfort Index for Kimberly is below average by 13 points. Kimberly offers a vibrant culture for seniors with activities like the Kimberly Community Band, the Paperfest festival, Art in the Park, free yoga, gardening and craft classes, amphitheater events and relaxing Sunset Beach. Kimberly has an array of community resources for seniors, including Kimberly Senior Citizens, an organization that provides recreation, leisure and social opportunities, as well as x senior centers. Kimberly is home to world-class medical facilities, including the Association of Wisconsin Surgery Centers, in the event of medical emergencies or illness. Assisted Living costs in Kimberly start around $3,850 per month on average, while the nationwide average cost of assisted living is $4,000 per month, according to the latest figures from Genworth’s Cost of Care Survey. It’s important to note that assisted living rates in Kimberly and the surrounding suburbs can vary widely based on factors such as location, the level of care needed, apartment size and the types of amenities offered at each community. 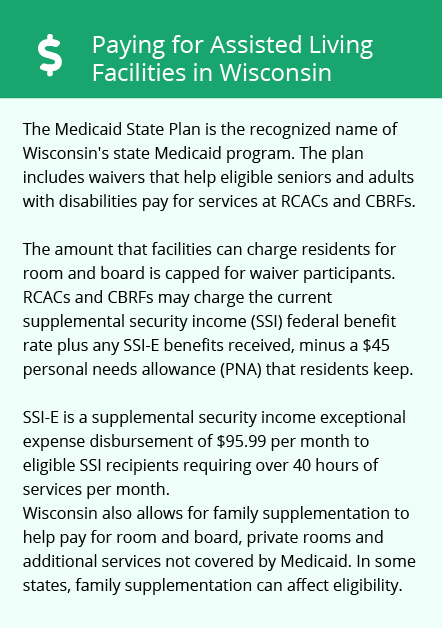 The SSI Exceptional Expense Supplement (SSI-E) provides very limited funding to seniors in Wisconsin, including Kimberly, who might require financial aid for ALF programs. Kimberly and the surrounding area are home to numerous government agencies and non-profit organizations offering help for seniors searching for or currently residing in an assisted living community. These organizations can also provide assistance in a number of other eldercare services such as geriatric care management, elder law advice, estate planning, finding home care and health and wellness programs. To see a list of free assisted living resources in Kimberly, please visit our Assisted Living in Wisconsin page. Kimberly-area assisted living communities must adhere to the comprehensive set of state laws and regulations that all assisted living communities in Wisconsin are required to follow. Visit our Assisted Living in Wisconsin page for more information about these laws.